Modern squared tufted chaise lounger for sale with free shipping. Top Amazon ratings with thousands of 5-star customer reviews. It's a perfect addition to any living room, bedroom, dorm room, den, studio or home office. With its tufted faux leather or linen upholstery and stylish chrome legs, this chair is modern and contemporary, and suitable for any room décor. The multi-position back features Click-Clack technology, which quickly converts the chaise from lounger to sleeper. Great as a daybed too. 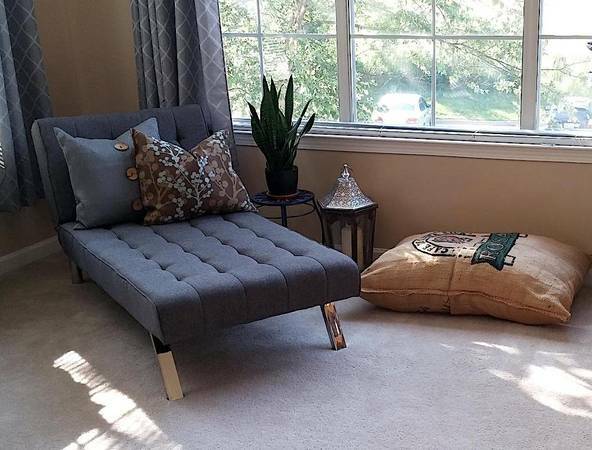 Spacious enough to lounge comfortably alone, or combine with matching futon to create a sectional sofa and to have additional seating and sleeping space for your guests. Quick and easy assembly, all tools included.